Chronic suppurative otitis media (CSOM) with cholesteatoma has the potential for intracranial spread of infection. Although there has been a marked decrease in the incidence of otogenic intracranial complications because of early diagnosis and prompt treatment of ear infection, availability of higher antibiotics, and advances in otological surgical techniques, otogenic intracranial complication persists as a difficult problem. , CSOM accounts for 28,000 deaths and a disease burden of more than 2 million Disability Adjusted Life Years (DALYs). Over 90% of the burden is borne by countries in the South-East Asia and Western Pacific regions, Africa, and several ethnic minorities in the Pacific rim. The most commonly encountered intracranial complication is meningitis followed by brain abscess. Brain abscess was the first complication of otitis media to be recognized and the first one successfully treated by operation. It was in 1768 that Morand reported a successful operation for brain abscess. In 1856, Lebert accurately described the pathology of brain abscess, confirming the fact that it follows infection of the ear, not the reverse. The treatment of otogenic brain abscess consists of medical management in the form of antibiotics and the agents to lower the intracranial pressure and surgical management which include burr hole or craniotomy to drain the brain abscess by neurosurgeon and removal of the ear and mastoid cholesteatoma by radical or modified radical mastoidectomy done by otologist. 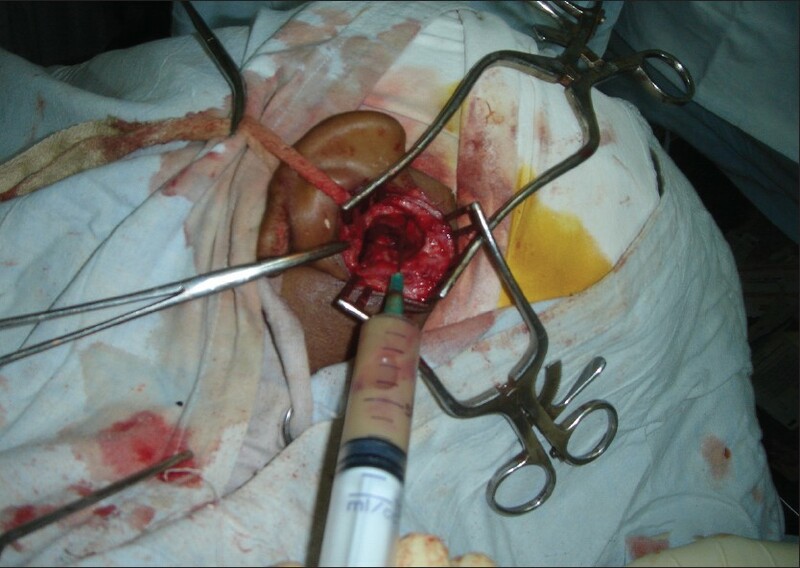 In our setup due to lack of neurosurgical facility, the otogenic brain abscess patients were treated by otologists by radical or modified radical mastoidectomy and approaching the brain abscess through defect in tegmen antri and Trautmann's triangle. The objectives of this study were to review our experience on treating otogenic brain abscess transmastoid route with particular reference to symptoms, signs, intraoperative findings, and results. This article will review our experience with 72 patients of otogenic brain abscesses treated from January 1997 to December 2010 in our hospital. All cases of CSOM with suspected intracranial complications were subjected to clinical examination, neurophysicians opinion, fundoscopy by ophthalmologists, and imaging by computed tomography (CT) scan. Brain abscesses from other origins and extradural abscesses were excluded from this study. According to the severity of the disease, modified or radical mastoidectomy was performed under general anesthesia. In temporal lobe abscess, the dural plate was carefully examined to look for erosion. If granulations were present on dura, the tegmen antri was removed till healthy dura was seen. Brain cannula was inserted into the abscess cavity through the healthy portion of the dura and the pus was aspirated off [Figure 1]. The abscess cavity was irrigated with antibiotic solution. In cerebellar abscess, the sinus plate examined for erosion, presence of granulation, perisinus abscess, and sinus was palpated for signs of thrombosis, and aspiration of sinus was done. If no free flow of blood, sinus was exposed from sinodural angle up to mastoid tip and sinus was incised and thrombus was removed till there was free flow of blood. 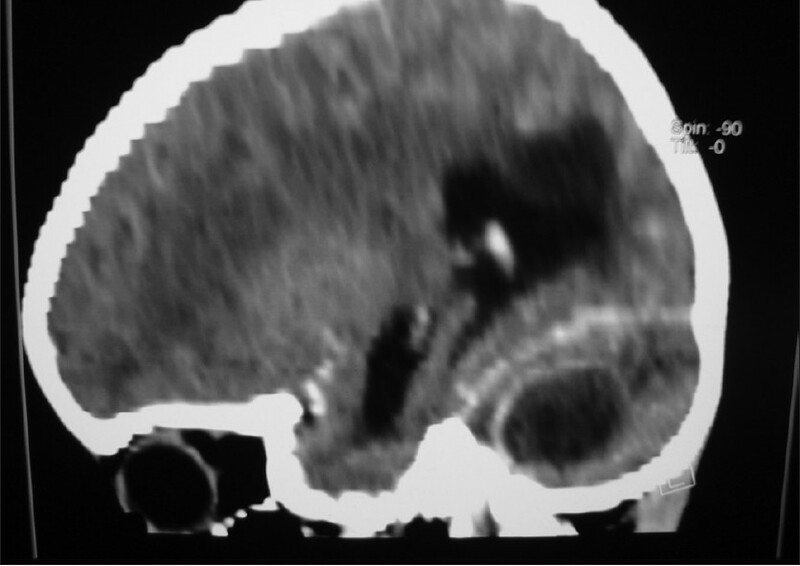 Aspiration of cerebellar abscess was done through the Trautman's triangle [Figure 2]. Hemostasis was achieved, and antibiotic pack was kept in operated cavity. Postaural wound was not sutured. Repeated aspiration of brain abscess was done after every 48 hours. Clinical status of patient was assessed and abscess was also assessed by repeat CT scan, when satisfactory secondary suturing of postaural incision was done at a later date. Antibiotics continued for almost 1 month after surgery. From the total of 72 patients, 40 patients were male and 32 were female. Ages of patients ranged from 6 years to 54 years with the mean age of 16 years. 85% patients were below 20 years of age. Otological diagnosis revealed that 62 (85%) patients were having cholesteatoma while 10 patients were having granulations in middle ear and mastoid air cells [Table 1]. Cerebellar abscess was found in 60 patients (83%) while temporal lobe abscess was found in 12 patients [Table 2]. In all, 48 patients were having more than one intracranial complication. Lateral sinus thrombosis was found in 15 patients, meningitis in 4 patients, and epidural empyema in 20 patients. Intratemporal complications such as labyrinthine fistula was found in 36 patients and facial nerve palsy seen in 6 patients [Table 3]. Out of 12 cases of temporal lobe abscess, morbidity was seen in one patient in the form of persistence of hemiplegia. Mortality was seen in two patients of temporal lobe abscess and in three patients of cerebellar abscess. All patients of facial nerve palsy had undergone facial nerve decompression and two patients showed partial improvement. Pus was sent for Gram staining and culture sensitivity. In 80% of patients, pus was sterile on culture. Remaining 20% showed variable causative organisms, e.g., Escherichia More Details coli, Pseudomonas aurugenosa, Proteus spp., Staphylococcus spp., and Streptococcus spp. Spread beyond middle ear cleft can occur due to destruction by cholesteatoma, through fracture lines, preformed pathways, through the Haversian system of veins or through the periarterial space of Virchow Robin. In this era of antibiotics, incidence of complications is reduced due to awareness of disease, advances in diagnostic, and treatment modalities. 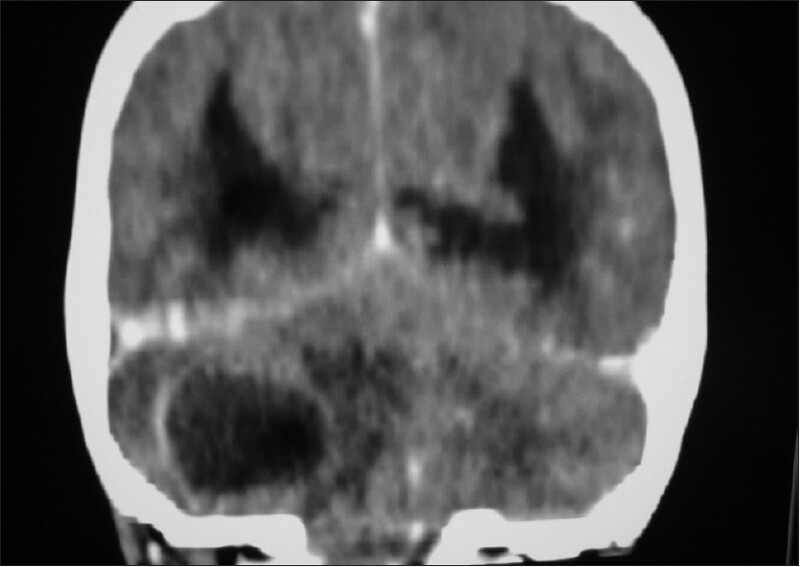 The clinical diagnosis of intracranial complication and brain abscess are not reliable and must be confirmed by CT scan [Figure 3] and [Figure 4]. This is also not an invasive, quick, and reliable method of preoperative and postoperative assessment of patients of otogenic brain abscess. HRCT temporal bone sometimes misses the temporal bone abscess, so CT brain plain plus contrast must be complimented by the HRCT. Open cavity mastoidectomy was used as a method of choice in our series. In modified radical mastoidectomy, hearing preservation was attempted by ossiculoplasty and myrigostapedopexy. The mean follow-up period was 1 year and seven patients required revision surgery. Hence, recurrence rate was 12% which was comparable to the existing series. The mean duration of hospitalization was 15 days. Postoperative follow-up was kept with serial CT scans in clinically suspicious cases. Otogenic brain abscess is a challenging condition to manage. High degree of suspicion is indicated for diagnosis for which CT scan with contrast is of immense help. 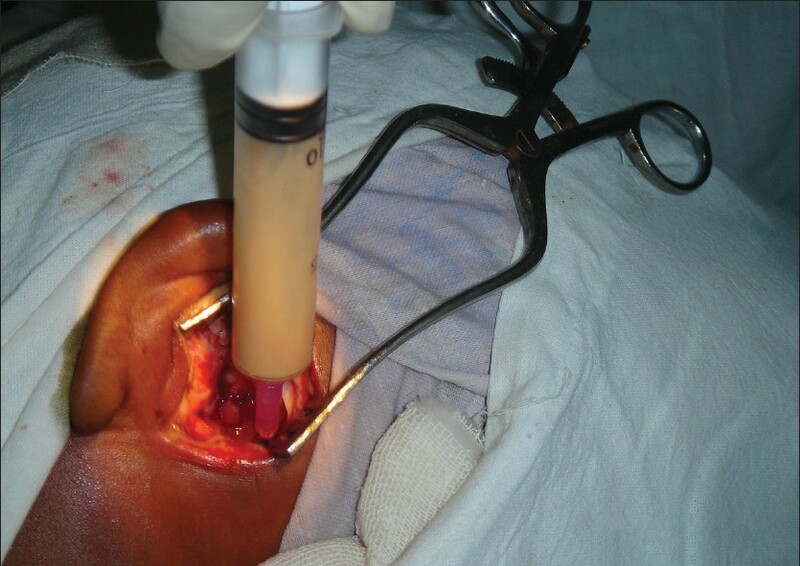 Transmastoid drainage of otogenic brain abscess is equally safe and efficient modality of treatment of otogenic brain abscess in the area where neurosurgical facilities are not available. It deals with primary focus of infection with the secondary intracranial complication in single setting avoiding two-stage procedure. Dr. Shinde Dean, Dr. VMGMC Solapur for permission for publication. 1. Samuel GJ, Fernandes CM, Steinberg JL. Intracranial otogenic complications: A persisting problem. Laryngoscope 1986;96:272-8. 2. Gower HD, McGuirt WF. Intracranial complications of acute and chronic infectious ear disease: A problem still with us. Laryngoscope 1983;93:1028-33. 3. Chotmongkol V, Sangsaard S. Intracranial complications of chronic suppurative otitis media. Southeast Asian J Trop Med Public Health 1992;23:510-3. 4. Nunez DA, Browning GG. Risks of developing otogenic intracranial abscess. J Laryngol Otol 1990;104:468-72. 5. Iseri M, Aydin O, Ustündag E, Keskin G, Almaç A. Management of lateral sinus thrombosis in chronic otitis media. Otol Neurotol 2006;27:1098-103. 6. Yen PT, Chan ST, Huang TS. Brain abscess: With special reference to otolaryngologic sources of infection. Otolaryngol Head Neck Surg 1995;113:15-22. 7. Nalbone VP, Kuruvilla A, Gacek RR. Otogenic brain abscess: The syracuse experience. Ear Nose Throat J 1992;71:238-42. 8. Ludman H. Complications of suppurative otitis media. In: Kerr AG, editor. Scott Brown's otolaryngology. 5 th ed. London: Butterworth and Co; 1987. p. 264-91. 9. Sengupta A, Ghosh D, Basak B, Anwar T. Clinicopathological study of otogenic brain abscess. Indian J Otolaryngol Head Neck Surg 2009;61:291-6. 10. Kulai A, Ozatik N, Topcu I. Otogenic intracranial abscesses. Acta Neurochir (Wien) 1990;107:140-6. 11. Kangsanarak J, Fooanant S, Ruckphaopunt K, Navacharoen N, Teotrakul S, et al. Extracranial and intracranial complications of suppurative otitis media. Report of 102 cases. J Laryngol Otol 1993;107:999-1004. 12. Sennaroglu L, Sozeri B. Otogenic brain abscess: Review of 41 cases. Otolaryngol Head Neck Surg 2000;123:751-5.